Magnesium and B-complex vitamins are both nutrients capable of activating enzymes that control digestion as well as playing a role in the utilisation of proteins, fats, and carbohydrates. A deficiency of these key nutrients can cause a vast array of health issues ranging from weak, brittle bones to an inability to concentrate or focus for long periods of time. Ever found yourself craving dark chocolate or nuts? Food cravings and overeating can often be a sign that your body is deficient in certain nutrients missing from a diet rich in processed foods. Magnesium also plays a role in the chemical reaction needed to allow glucose into cells. If there is not enough Magnesium present in your system to do this, levels of both insulin and glucose become raised. This excess glucose gets stored as fat and contributes to obesity and an excess of insulin is known to be a contributing factor to diabetes. 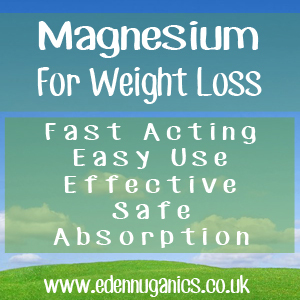 As well as many beneficial chemical reactions, Magnesium is also known to help relieve stress. Many official studies have linked excess stress to rises in obesity, making magnesium another tool in the fight against obesity. Magnesium helps the body digest, absorb and utilize proteins, fats and carbohydrates. Magnesium is necessary for insulin to open cell membranes for glucose. Magnesium helps prevent obesity genes from expressing themselves. The recommended daily allowance for Magnesium is 400 mg per day for men and 310 mg per day for women. Unfortunately a substantial numbers of adults in the United Kingdom and other western countries fail to reach these levels. Consuming less than the recommended amount could cause a deficiency and affect your body's ability to function properly. Will Magnesium Work On Its Own? Consuming Magnesium alone will not be enough to lose weight; When looking to shed some pounds, your diet need to be in a calorific deficit. This is one of the reasons why low-calorie Magnesium-rich foods can be so helpful. Spinach, halibut and yoghurt can be particularly useful. Green Tea - Green tea is not only packed full of powerful antioxidants but it also helps to increase fat oxidation, meaning you burn your fat reserves faster. Green tea is also known to help you feel fuller for longer after a meal so you don't eat more than you need. Not only this, but a substance found in green tea known as EGCG reduces the amount of fat your body absorbs when you eat your food. This is not only helpful in weight loss efforts, but also in reducing your cholesterol levels and reducing high blood pressure. How Should I Take My Green Tea? The first step is to add 1 - 2 tablespoons of good quality green tea to a glass cup or bowl. Next, pour hot water over the leaves and allow it to brew for around 2 minutes. Taste it. If you want more flavour, allow an extra two minute brew time. It is best to avoid boiling water as this can damage some of the antioxidant properties. Usually people brew green tea for 2-5 minutes. Strain using a fine mesh sieve and drink while still warm. As this is for weight loss, it is best to avoid adding sweetener to the tea, although Agave or Manuka honey can be added if needed. Ginseng - Ginseng has long played a central role in traditional Chinese medicine. Used to enhance energy, stamina and overall well-being this ancient herb offers a vast array of health benefits. Modern researchers have recently found ginseng to be effective for weight loss as well as helping to control diabetes. Ginseng helps weight loss in two key ways. First, it helps to boost metabolism. People with high metabolisms store less fat from the food they eat. Secondly, ginseng will fill you with energy in a similar manner to coffee helping you to remain more active and thus use more calories.